B’midbar is called Numbers in English. 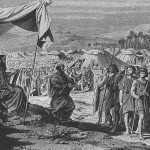 It enumerates the statistics of the Children of Israel in the wilderness. It gives us information that it is useful to know. With details of the size of a population you can make provision for health, housing, education and other essential services. This information is valuable but one-dimensional and flat. It tells us how many people we can count, but not how many we can count on. Are any of them passionate about or even moderately committed to anything? When there is a crisis, how many are prepared to stick their neck out? Some rabbis can quote impressive statistics. But in many cases these large numbers are only nominal. A considerable proportion hardly ever put in an appearance; some pay membership fees but never attend services at all. Obviously none of them should be denigrated or made to feel unwanted. Not only does their membership keep the facilities going, but someone who may be rather passive for years on end can suddenly come out of the woodwork and become a tower of strength. But how long must we wait for the miracle? The need of the hour is for people who are prepared to be counted on without a crisis, who will pull their weight without an emergency, who do not even need votes of thanks or golden plaques.